Moving away from the current season of bling and shimmer, Wendell Rodricksa�� Spring Summer 2015 show at The Park tomorrow will be a welcome change. The collection is supposed to capture the positive and peaceful vibe of yoga. a�?What set me thinking was my time in Mongolia. I saw the vast Steppes and the calm, and the collection fell into my head,a�? Rodricks explains about the line titled Yoga Calm. Done completely in pristine white, the casual and resort wear will be presented without meddling with the purity of the textiles. a�?White is my colour. Unlike the North, it is the colour of life in South India. White also shows my cuts and silhouettes best,a�? he insists. As the models walk in the tranquil setup tomorrow, a�?one will forget the chaos of the world,a�? promises Rodricks, who is coming to the city after 20 months (he was here last February to talk about his book, The Green Room). Expect crinkle organza stoles, 1960s-inspired trousers from Kerala, gauze linen shift dresses with satin silk stripes, corset-inspired tunics and swimwear, all in white. The highlight of the show, however, will be the gauze linen saris with pintuck blouses, which will remind you of veteran actress Rekha, in the 1981 hit film, Silsila, who Rodricks has dedicated the collection to. a�?Rekha is a dear friend. We share many common sensibilities; one of them is yoga. So I dedicated this collection to her because she was the first actress to do a yoga video, besides the fact that she turned 60 recently. This seemed like a fitting birthday gift,a�? the Goa-based designer says. Youa��ll also find satin silk cocktail dresses with looped panels, pleated cocktail jumpsuits and triple-layer georgette dresses a�� which let the fabrics do the talking without using any embellishments. a�?I have always been a promoter of handwovens. This time, I took my minimalism to a new standard,a�? he quips. 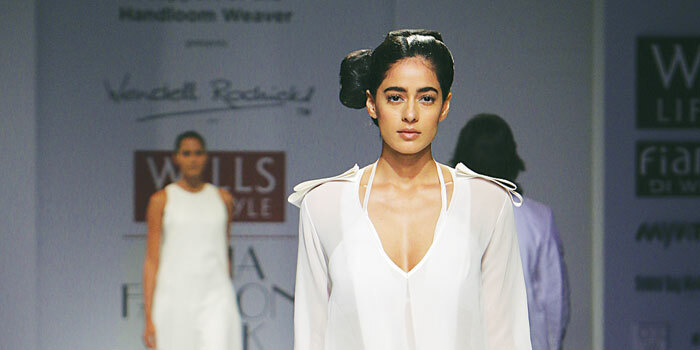 The collection, which was showcased and applauded at the Wills India Fashion Week recently, has a few additions for the city audience. The outfits will be available at Amethyst and Evoluzione by February next year and Rodricks is open to customisinga��for a different colour or hemline. After being awarded the Padma Shri and the Chevalier de La��Ordre des Arts et Lettres this year, the meticulous designer is going to make more newsa��for he is working on his third book that he hopes to complete before the year ends.